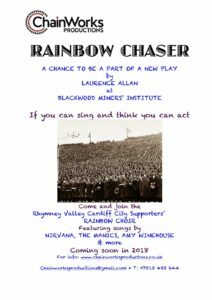 Rainbow Chaser is Larry Allan’s next play, currently in development with Blackwood Miners’ Institute. It’s a story of gambling, football and rock ‘n roll and hinges on Cardiff City’s perennial dream of repeating their FA Cup triumph of1927 and one group of local punters’ annual bet of it actually happening. This 1927 Club is challenged by an alternative 1927 Club – representing the 19 rock ‘n roll stars who have died aged 27. Their bet is on who will die next. We will be forming the Rhymney Valley Cardiff City Supporters Rainbow Choir with a repertoire of songs by Nirvana, the Manics and Amy Winehouse to sing Cardiff City all the way to Wembley.